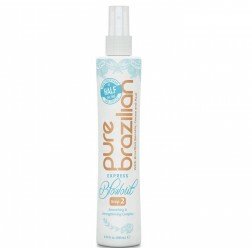 Pure Brazilian is arguably the best heat activated hair smoothing system available on the market. Pure Brazilian offers a choice of 2 different Solutions- Pure Brazilian Original Reconstructor and the Pure Brazilian CLEAR. The hair can be washed the same day as Pure Brazilian requires “no down time”. Both last up to 3 months as hair reverts back to its natural texture. No line of demarcation or damage!